About "Order of rotational symmetry of a circle"
The order of rotational symmetry of a circle is, how many times a circle fits on to itself during a full rotation of 360 degrees. A circle has an infinite 'order of rotational symmetry'. In simplistic terms, a circle will always fit into its original outline, regardless of how many times it is rotated. Hence, a circle has infinite order of rotational symmetry. What is the order of rotational-symmetry of an equilateral triangle ? As explained in the definition, we have to check, how many times an equilateral triangle fits on to itself during a full rotation of 360 degrees. 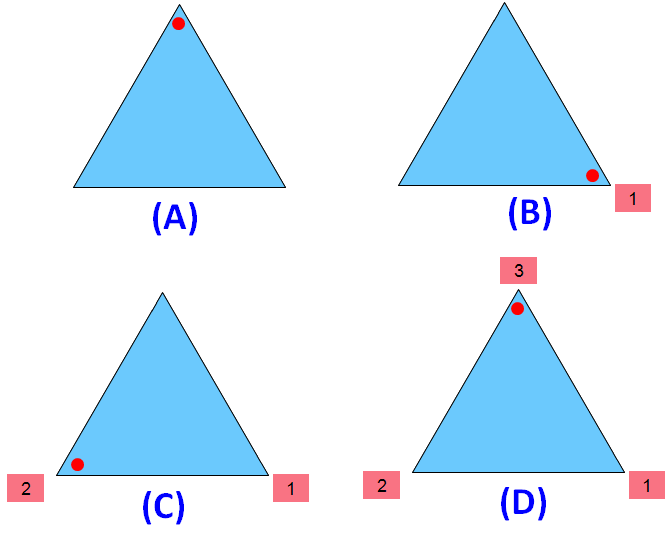 Please look at the images of the equilateral triangle in the order A,B and C. A is the original image. The images B and C are generated by rotating the original image A. When we look at the above images of equilateral triangle, it fits on to itself 3 times during a full rotation of 360 degrees. Hence, an equilateral triangle has rotational symmetry of order 3. On this web page "Order of rotational symmetry of a circle", next we can look at the order of rotational symmetry of a different figure. What is the order of rotational-symmetry of a square ? As explained in the definition, we have to check, how many times a square fits on to itself during a full rotation of 360 degrees. 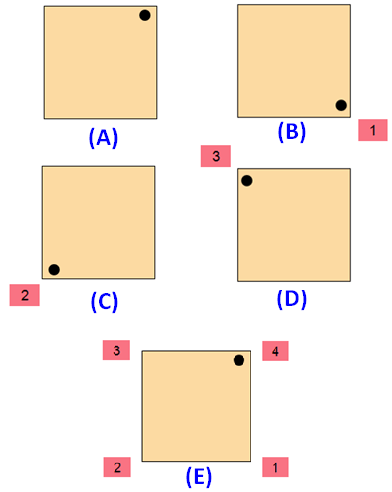 Please look at the images of the square in the order A, B, C, D and E. A is the original image. The images B, C, D and E are generated by rotating the original image A. When we look at the above images of square, it fits on to itself 4 times during a full rotation of 360 degrees. Hence, a square has rotational symmetry of order 4. What is the order of rotational-symmetry of a regular pentagon ? As explained in the definition, we have to check, how many times a regular pentagon fits on to itself during a full rotation of 360 degrees. Please look at the images of the regular pentagon in the order A, B, C, D, E and F. A is the original image. The images B, C, D, E and F are generated by rotating the original image A. When we look at the above images of regular pentagon, it fits on to itself 5 times during a full rotation of 360 degrees. Hence, a regular pentagon has rotational symmetry of order 5. 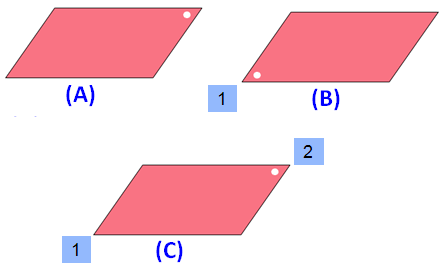 What is the order of rotational-symmetry of a parallelogram ? As explained in the definition, we have to check, how many times a parallelogram fits on to itself during a full rotation of 360 degrees. 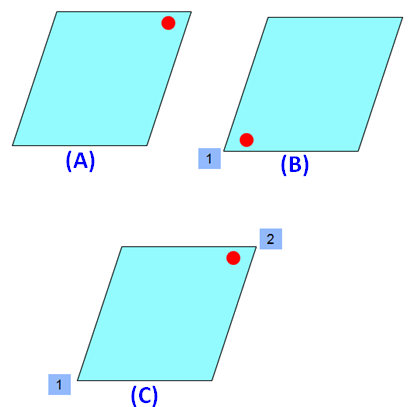 Please look at the images of the parallelogram in the order A, B and C. A is the original image. The images B and C are generated by rotating the original image A. When we look at the above images of parallelogram, it fits on to itself 2 times during a full rotation of 360 degrees. Hence, a parallelogram has rotational symmetry of order 2. What is the order of rotational-symmetry of an isosceles triangle ? As explained in the definition, we have to check, how many times an isosceles triangle fits on to itself during a full rotation of 360 degrees. 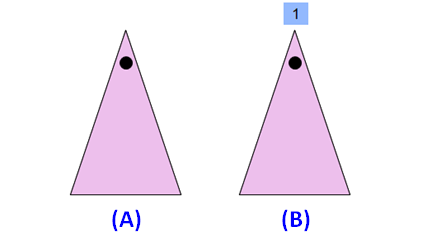 Please look at the images of the isosceles triangle in the order A and B. A is the original image. The image B is generated by rotating the original image A. When we look at the above images of isosceles triangle, it fits on to itself 1 time during a full rotation of 360 degrees. Hence, an isosceles triangle has rotational symmetry of order 1. What is the order of rotational-symmetry of an scalene triangle ? As explained in the definition, we have to check, how many times an scalene triangle fits on to itself during a full rotation of 360 degrees. 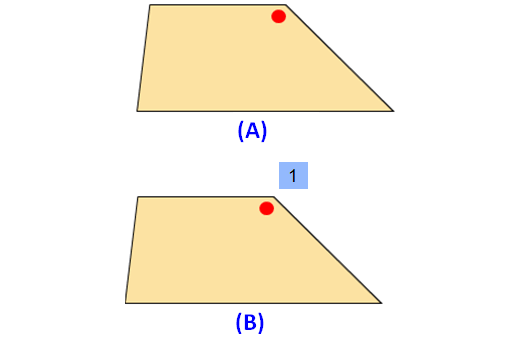 Please look at the images of the scalene triangle in the order A and B. A is the original image. The image B is generated by rotating the original image A. Hence, a scalene triangle has rotational symmetry of order 1. What is the order of rotational-symmetry of a trapezium ? As explained in the definition, we have to check, how many times an trapezium fits on to itself during a full rotation of 360 degrees. 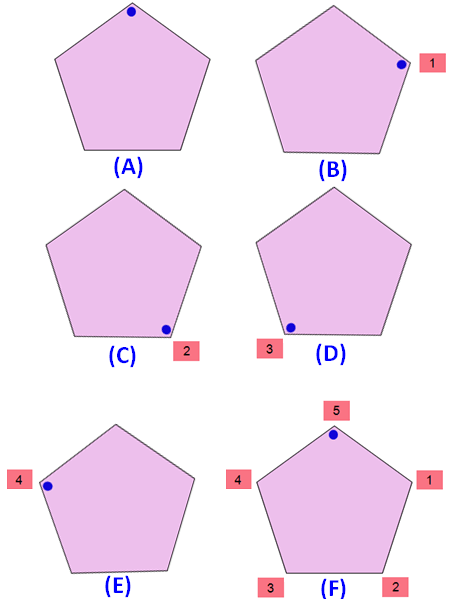 Please look at the images of the trapezium in the order A and B. A is the original image. The image B is generated by rotating the original image A. When we look at the above images of trapezium, it fits on to itself 1 time during a full rotation of 360 degrees. Hence, a trapezium has rotational symmetry of order 1. What is the order of rotational-symmetry of a isosceles trapezium ? As explained in the definition, we have to check, how many times an isosceles trapezium fits on to itself during a full rotation of 360 degrees. 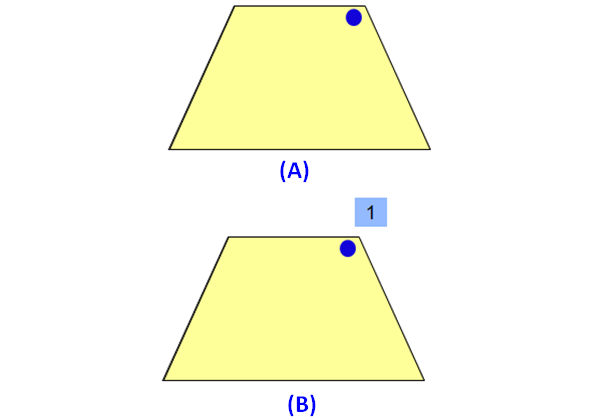 Please look at the images of the isosceles trapezium in the order A and B. A is the original image. The image B is generated by rotating the original image A. When we look at the above images of isosceles trapezium, it fits on to itself 1 time during a full rotation of 360 degrees. Hence, an isosceles trapezium has rotational symmetry of order 1. What is the order of rotational-symmetry of a kite ? As explained in the definition, we have to check, how many times a kite fits on to itself during a full rotation of 360 degrees. 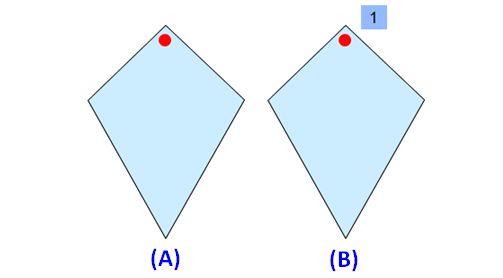 Please look at the images of the kite the order A and B. A is the original image. The image B is generated by rotating the original image A. When we look at the above images of kite, it fits on to itself 1 time during a full rotation of 360 degrees. Hence, a kite has rotational symmetry of order 1. What is the order of rotational-symmetry of a rhombus ? As explained in the definition, we have to check, how many times a rhombus fits on to itself during a full rotation of 360 degrees. Please look at the images of the rhombus the order A, B and C. A is the original image. The images B and C are generated by rotating the original image A. When we look at the above images of rhombus, it fits on to itself 2 time during a full rotation of 360 degrees. Hence, a rhombus has rotational symmetry of order 2. What is the order of rotational-symmetry of an ellipse ? As explained in the definition, we have to check, how many times an ellipse fits on to itself during a full rotation of 360 degrees. 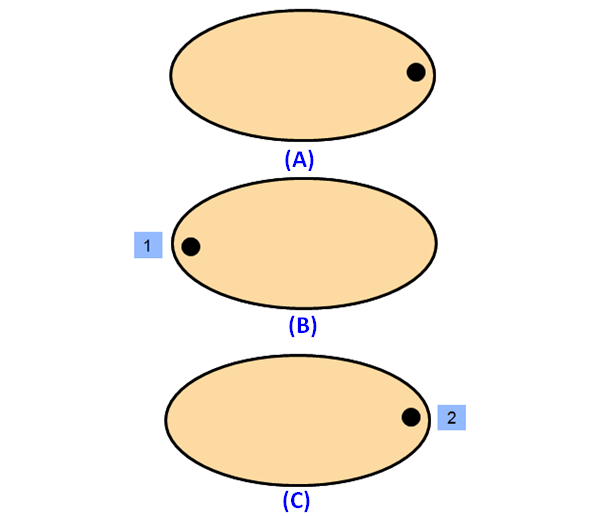 Please look at the images of the ellipse the order A, B and C. A is the original image. The images B and C are generated by rotating the original image A. When we look at the above images of ellipse, it fits on to itself 2 time during a full rotation of 360 degrees. Hence, an ellipse has rotational symmetry of order 2. We hope that the students would have understood the stuff given on "Order of rotational symmetry of a circle"
If you need any other stuff, please use our google custom search here.